Hello dear friends, today we are we thought it would be great to do something different and that’s why we decided that we are going to teach you how to crochet sandals with flip flop soles. And we have a Free pattern… And a video. So there are at least three reasons why you should be happy you found this article! 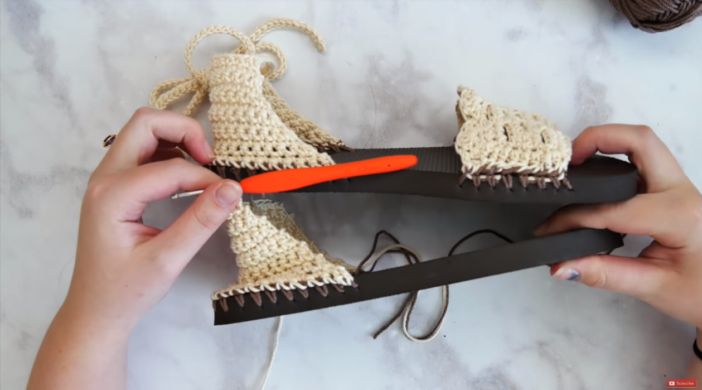 There are so many variations of flip flop soles and so many ways to crochet them. But this one will definitely become one of your favorites. After the idea was born, further steps were like a blueprint. We needed to find a good video, create an awesome photo collage and combine all of this into one great article! That’s exactly what we did. And somewhere along the way we came across this free pattern as well and decided our readers would be happy if we shared it… And of course, we are sharing it with you. So we have a tutorial with video and a free pattern. You will absolutely love this technique and it will definitely become an inspiration to crochet a lot of stuff. We promised you a free pattern, didn’t we? It’s on a page of the video! Sewrella channel is a genius behind this amazing video we decided to share with you, our beloved readers!